High rainfalls and grand outdoors make this remote and sparsely populated region a fascinating place. A long stretch of land between the Southern Alps and the Tasman Sea, the West Coast boasts particularly scenic, rugged scenery and charming modestly-sized townships. The abundance of pounamu, or green stone, made the West Coast a region of choice for early Māori settlers. Yet, European travellers did not flock to the area until gold and coal were discovered in the late 19th century, and the latter remains a major industry today. Due to the historical remoteness and difficulty of access, most of the region is wild and administered by New Zealand’s Department of Conservation. 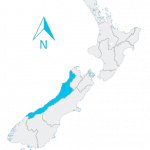 However, two airports with connections to Wellington and Christchurch make the West Coast as easy a region to work from or live in as any. With 19 summits over 3,000m tall, most less than 50km from the coast, it’s a gigantic mountain chain that looms over the West Coast. Famous travel guide Lonely Planet ranked the region within the Top 10 Coastal Drives of the World. Rapidly changing conditions and high rainfalls ensure the landscape is green all year round and if New Zealand as a whole is a great outdoors destination, the West Coast definitely adds quite a bit of adventure to it! This contributes to a relatively mild weather all year round. Locals are known for being independent and laid-back due to the relative isolation of this region. Nonetheless, Greymouth, Westport, and Hokitika provide all required amenities. Industries include mining for coal and alluvial gold. Forestry/timber are also strong, and so is fishing, and somewhat farming (dairying particularly will see several West Coast jobs opportunities with two major cooperatives in the region). Tourism and eco-tourism are important contributors to the region’s economy with thousands of overseas visitors hiking, biking, kayaking, or climbing around the region. The main focus is on the southern glaciers, fjords, and forests, as well as Punakaiki’s “pancake rocks” further north.